Before moving to Boston last year I sold somewhere around 700 books. If you live in the Charlottesville area you are likely to find most of them at Daedalus Used Books on 4th street downtown. Now as I look around the shelves are beginning to fill up once again. Jason Emerson, Giant in the Shadows: The Life of Robert T. Lincoln , (Southern Illinois University Press, 2012). Josesph Glatthaar, Soldiering in the Army of Northern Virginia: A Statistical Portrait of the Troops Who Served under Robert E. Lee , (University of North Carolina Press, 2011). Amy S. Greenberg, A Wicked War: Polk, Clay, Lincoln, and the 1846 U.S. Invasion of Mexico , (Knopf, 2012). Clayton E. Jewett, ed. The Battlefield and Beyond: Essays on the American Civil War, (Louisiana State University Press, 2012). My favorite statistic in Glatthaar’s book: While immigrants made up roughly a quarter of Union soldiers, they made up 3% of soldiers in the Army of Northern Virginia. Bummer and his wife have often discussed selling some of our books. It never happens. We have boxes of unopened volumes from moves in and around California over the years and they still sit sealed in our new domicile. The cost of physically moving them is difficult to begin to calculate. However, it doesn’t stop us from continuing to buy. The literary doors that have been opened to Bummer in just the last ten years has increased the inventory monumentally. This “old guy” organizes and catalogs by “stacks and piles” in the office, a potentially dangerous room to enter. Levin keeps showcasing titles and Bummer keeps buying. A potential mental illness? Maybe a new pill will help! I would be interested in comments on the Greenberg book. The one review I read in the WSJ was critical. I am almost finished with A Wicked War. I am enjoying it immensely. The subtitle should signal the reader that this book about the U. S. – Mexican War has very little fighting in it. Some major campaigns get just a mention. The point of the book really is to identify some major political and social players, and how the war effected them. People who read about Lincoln and the Civil War need to learn more about John Hardin, not just because his death a Buena Vista removed him from Lincoln’s path to political prominence, but because his martyrdom provided a military hero for Polk’s political opposition. Her treatment of Henry Clay reveals some tangible reasons why Lincoln admired him. Many Lincoln bios are satisfied with identifying Lincoln as a Clay man before the rise of the Republicans. Greenberg explains why. Sarah Polk and Nicholas Tryst also get solid treatments here. 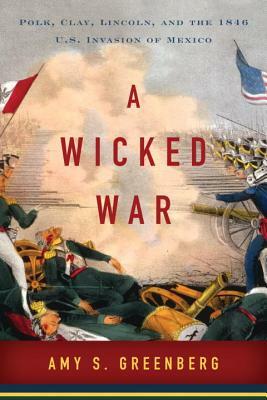 I didn’t read the WSJ review, but I would anticipate certain negative criticisms by warning readers that A Wicked War is a political and social history, and it explains very little about why the fighting worked out the way it did. I’d still recommend K. Jack Bauer’s The Mexican War 1846-1848 for a solid military history if the war. I agree that Hardin is quite interesting. Indeed. Greenberg didn’t mention it, but Hardin’s death started another chain of events fascinating to a guy like me who researches and writes about Shiloh. When Hardin led his men down that gully and into a massacre by Santa Anna’s Lancers somebody had to lead the survivors out of the mess. That was Lt. William H. L. Wallace, the adjutant of the 1st Illinois. That act of heroism set up Wallace for early prominence in the Illinois Volunteers during the Civil War (Colonel of the 11th ILL), and by good performance in that role to stars that he sewed on his shoulders a few days before his own martyrdom in the Hornets Nest. It was the frontier. Everybody knew everybody else. It is easy for us to forget that as these names pop up in multiple volumes on varied topics. That is very interesting. Thanks for sharing. He finds her treatment of Polk to be unduly negative. A bit off the subject, but I ran across an image related to the Crater you might finding interesting. Perhaps you’ve seen it already. It is from a collection at Boston College of sketches by one of the Frank Leslie artists. It is a distant sketch showing artillery fire and is labeled “Siege of Petersburg-Charge Into the Crater”. It’s in the featured imagines about 2/3rd’s of the way in. It’s been awhile since I’ve studied maps of the area, so it’s kind of hard to put everything in context. You do actually see Petersburg proper in the background. Here is the link.